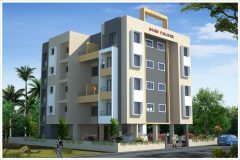 #1Hall, 1Master Bed, 1Bed, 1Kitchen, 1Common Toilet Bathroom, 2Balcony. #Free Separate Parking for Car and Two Wheeler. #Beside Bsnl Office, District Court, Gogate Joglekar College. Site: Ashutosh Enclave, A Wing, Flat no, On Ratnagiri-Bhatye Beach Road, Tal- Dist Ratnagiri.